Farming comes in so many forms, and Tim Brod from Highland Honey Bees has shown us that. A devoted bee keeper, Tim has created not only delicious honey products, but also bee habitats that are breathtaking. 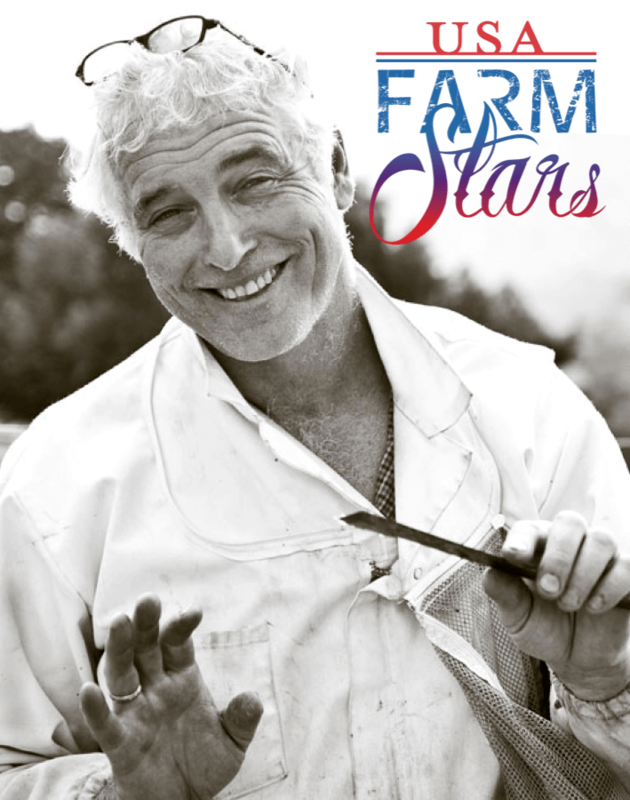 His knowledge keeps honey bees alive and for that reason, he is one of our Farm Stars. Food: I’m such a foodie it changes all the time but my favorite food is fresh food. I just got back from India, so right now it’s well spiced food. Another favorite is seafood. Drinks: I’m a big tea drinker – really great black teas are my favorite. Water is also my favorite and it’s on tap everywhere! Thing to do AFTER work: Make food with friends and wrestle with my son. Married, have a child and lots of animals. Does your child help on the farm? I have one son and he helps with the bees. He’s only seven so he works with them in bits and spurts. He told me he wants to be a beekeeper. I don’t know if he said that only to talk me into getting him ice cream but he does really love it and can’t wait when he’s older to be more involved. He also says I have the best tasting honey around. I like his loyalty and good taste. He also comes to farmers markets and demos on occasion. Farthest I’ve traveled… well I’ve been lucky because I’ve been all over the world and I’d be interested to go to Northeastern Russia to investigate bee practices and bee keeping in Siberia. It’s really meant to be enjoyed and spent on family, friends, and community. That’s really my first idea. If you have money, then you want to use it and enjoy it. I come from immigrant parents. There was agriculture on both the matrilineal and patrilineal sides of my family. My grandfather kept bees, and I grew up with a deep affinity for looking at systems, social and biological. As a kid I always was outside - playing in the dirt, picking up bugs or going fishing. Bees are very complex, and are part of a very complex system. Honey Bees for example, are really indicator species for overall health of our planet. Keeping bees, raising queens, producing honey, teaching bee keeping, moving my hives into agricultural areas for pollination, is a very rewarding practice. It combines my love of the outdoors/agriculture with people. All parts are hard, but the biggest or hardest thing is giving yourself permission to just go for it. It’s really just making the choices to go for it. There are all kinds of reasons for hesitating or being ambiguous. All kinds of reasons… but its really just taking that risk to make it happen. I didn’t really have any surprises but gained insight to really appreciate that you never stop learning. It’s not really a surprise but an acknowledgement that it’s my job to keep learning and learning about bees. Tell us about your day; when does your day start and end? Bee keeping is very seasonal. In the months when it’s warm, working is from sunrise to sunset at least because you have to move bees. Keeping bees is following the food sources. I move the bees quite a bit, in the evening or early morning when they’re not flying. It’s pretty much like that from May till September, which are the long days. During the heat of the day I get to stop for a couple of hours. In the wintertime the bees are in Northern California for pollination. So the winter is about making trips back and forth from California, working with other beekeepers who are buying bee hives for the spring. I produce about 700 hives a year and this goes on from December till May. Every month is busy except November and that’s when I try to go fishing as much as possible. I really enjoy the process of working with the bees. It’s about opening the hive and doing an assessment of the hive. The hive will inform you what’s going on with it. So what makes me happy is being able to go through the hives and getting a snapshot on the health of the hive, which usually takes 3 to 15 minutes. What makes me frustrated is the tremendous failure to thrive that’s going on with bees right now. It’s when a hive isn’t making as much honey, a hive isn’t thriving like it should or the queen doesn’t have her fertility and seems impaired. Seeing those things going on in my hives makes me frustrated, but it makes me take steps so I can be different or learn how to make them thrive. Any lessons learned as a beekeeper? It helps me be patient. Seems very romantic – farming. The outdoors, the sun, the healthy lifestyle – and it is to a certain degree but it’s not the romance that sustains us. It’s really freaking hard work, there’s nothing easy about it. To Beekeepers: There’s been this whole resurgence in bee keeping in the last 5 -7 years so to just stick with it. Beekeeping is a process so it’s our job to understand, be patient, stick with it and learn to ask good questions. My advice to people who aren’t farmers is to not buy cheap honey in the grocery store because: 1.) Chances are its not real honey. 2.) Support truth and labeling laws – honey in the grocery store is abused and heated or from another country. So again, it’s most likely not real. 3.) Find out what “local” means because it could just mean the company is just paying taxes in the state and it might NOT even be local. 4.) Make healthy choices with your money. I’m really concerned for the health of honeybees and other pollinators. The honeybee lives in large colonies and is one of the main sources for pollinating. Seeing the trouble there is with system collapse, we seem to have unfettered use for chemicals and then make the presumption that it’s the best thing in the situation that we’re in but that’s not necessarily true. I’m concerned with the no regulation for pesticide use and the lack of forage and habitat. I’m also concerned with there being no truth in labeling laws. I think I’ll be older and hopefully smarter. I will still be in Colorado but will spend more months of the year working internationally with aid projects. Working with world development and agriculture – immigrating bee keeping practices into their culture and teaching them it’s vital for them. I hope I’ll be healthy too. Also, I plan to develop more collegial relationships with people who have the similar visions about agriculture and system approach as I do. I will also, of course, continue to be a provider for my family and community.